It’s the weekend, so that means it is time for some cold ones and some quality time with my laptop for a couple reviews before going back to my backlog of games. This time around it is a battery pack case for those heavy usage days, trade shows, or any other time you need a jump. 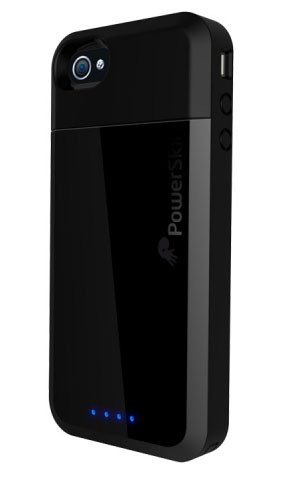 The power skin is equipped with a 1500mAh battery that is estimated to give you an extra 5 hours of talk time or 200 standby hours and is built to fit both Verizon’s and AT&T’s iPhone 4/4S. We have reviewed a couple of battery packs within the last year, so lets see how this powerful and protective case holds up, for not only the iPhone, but also a number of other current popular smartphone models. I am not someone that uses my phone for everything, I try to divvy up the usage evenly. There are those times however when I take the family out of town, camping, or when I am attending trade shows. Anyone that has strayed from their charger knows first hand of the battery leeches that show up when you need juice the most. This one piece partly hard plastic/partly soft rubber surface certainly comes through in a pinch and has a unique design that stands out from others out there like entries from Mophie, Third Rail, and Boostpack. With this powerful backpack fully charged, I was able to go from Wednesday morning through Friday night without having to recharge. Lastly the battery has four indicator lights on the backside to let you know how much juice is left before you need to recharge via micro USB. Aside from being a convenient back up in times of need, there were a couple reasons in which this powerful accessory will not be a more permanent case for my phone. Two reasons to be exact, the first of which is how the device is charged. The location is well placed, coming from the side of the phone, but the micro USB charger is not always as convenient for me as I have a number of 32-pin chargers for a number of apple devices. The latter pertains to the phone’s material, not the hard plastic battery pack, but the rubber material around the top and front of the phone. It is a tight fit when the phone is in place so you have to pull back and stretch in order to slide your phone into place and tends to grab my pocket and unloads the contents within when I reach for my phone. When all is said and done, this is a great case, especially if you don’t change your cases often. I say that because you have to stretch it quite a bit to get it on and off the phone. Though this isn’t the best case we have reviewed, it is far from being a bad case and is comparably priced in comparison to other cases that provide similar functions. The PowerSkin case is available now for the iPhone at the price of $69.99 and also available to a number of other smartphones on the market.